Up to 25% of the population report having had adverse reactions to foods. This is a very common phenomenon and one that is on the increase. Let’s explore Food Allergy in Detail. The true prevalence of food allergy is lower and seems to range from 1% to 4% of the general population and about 6% of the paediatric population, but does occur in as much as 25% of children with eczema. Consequently the general public perceive that food-related allergy is under-diagnosed, whilst most doctors feel that it is over-diagnosed. Many individuals have themselves noted that they are prone to develop adverse reactions to a specific food. They have then dealt with the problem by simply avoiding that food without ever seeking the advice of a doctor. Food Reactions modulated by the Immune System, these involve immediate hypersensitivity (IgE) and delayed T-cell mediated responses (non-IgE). These reactions may occur to minute amounts of the offending food in the diet. They depend on the bowel surface integrity and the individual’s ability to mount an abnormal immune response. This is true food allergy and accounts for 20% of all adverse reactions to food. Non-Immune mediated reactions may involve food malabsorption due to intestinal enzyme deficiencies (lactose intolerance), adverse reactions to naturally occurring chemicals in food (salicylates, histamine, serotonin and tyramine), as well as reactions to food containing preservatives (sodium benzoate and sulphites), flavourants (monosodium glutamate, aspartame) and colourants (tartrazine). These reactions usually related to the amount of offending additive or chemical in the food and are commonly referred to as food intolerance. Toxins and poison may naturally occur in food such as glyco-alkaloids (in potato), cyanogenic glycosides (in beans) and bacterial contaminants. Free histamine resulting from bacterial degradation of the flesh in scombroid fish results in scrombotoxicity – a pseudo allergic reaction typified by intense itching, rapid pulse and skin flushing. This reaction is due to the direct toxic effect of the spoiled food and is called food toxicity. Finally, some people are psychologically convinced that certain foods disagree with them, however, but when tested fail to react to that food. This occurs quite commonly and is referred to as food aversion. Allergic sensitization to food will occur in infants if there is a breach in the bowel surface integrity followed by an adverse immune response to a foreign food protein penetrating the intestinal surface. Certain foods seem to be more allergenic than others (Table 1). Fortunately enzymatic degradation of food in the intestinal tract tends to reduce this allergenicity. Secretory IgA, an antibody, also plays a protective role by combining with the allergens on the intestinal epithelial surfaces, further reducing allergen penetration. Mast cells, which release allergy mediators such as histamine, are present in the gastrointestinal surface and are found in increased numbers in allergic individuals. If intestinal barriers are weakened by inflammatory disease or IgA deficiency, allergen sensitization and allergic disease is more likely to occur. In infancy, reduced digestive capability and increased intestinal surface permeability are factors that enhance allergic sensitization to foods. As the gastrointestinal surface barrier naturally improves with age, so the incidence of food allergy tends to decrease with age. Food is most allergenic in the fresh form and cooking reduces or eliminates this allergenicity (with the exception of nuts and peanuts). Additives such as Sulphur dioxide or sulphites affect up to 40% of children with asthma, they are commonly ingested in dried fruit, soft drinks and sprayed onto fresh produce. It is the Sulphur dioxide gas, which is eructed from the stomach that results in throat irritation and wheezing. Allergic individuals also seem to have low levels of sulphite oxidase, the enzyme that normally metabolises sulphites in the diet. Sensitivity to Tartrazine the yellow food colorant is, despite it’s media publicity, quite a rare cause of food intolerance, it affects only 0.1% of the population. This colorant seems to act by causing histamine release via non-immune mechanisms and so exacerbates the symptoms of allergy. Certain allergic individuals with reduced levels of the histamine degrading enzyme Diamine Oxidase develop sneezing, flushing, runny nose, headaches and wheezing after ingesting foods rich in histamine. This reaction seems to be quite common and is often confused with food allergy. Histamine, Serotonin and Tyramine occur naturally in fish, certain cheeses, cured meats, some alcoholic beverages and Marmite. Food intolerance may also manifest with the inability to adequately digest the cow’s milk sugar Lactose, Fructose found in fruit juices and Gluten in wheat, resulting in cramping abdominal pain, offensive diarrhoea and failure to thrive in especially in childhood. Allergic reactions to food may manifest in the form of nausea, vomiting, flatulence, abdominal pain, cramping, diarrhoea and with non gastrointestinal illnesses such as rashes, eczema, swelling, nasal allergy, wheeze, angioedema and in some cases, even life threatening anaphylaxis. Fresh fruit, nuts, vegetables and spices may cause local tissue reactions on the lips, in the mouth and in the throat – this is the so-called Oral Allergy Syndrome (OAS). Oral allergy tends to occur more commonly in individuals who are allergic to Birch and Grass pollen. Some food allergic people may also develop flushing, shortness of breath, hives and fainting following strenuous exercise. This condition is known as food related Exercise-induced Anaphylaxis. It can occur for up to 12 hours after ingesting offending food such as shellfish, celery and wheat. Evidence now suggests that Coeliac Disease may be due to delayed T cell-mediated allergy to dietary gliadin found in wheat, rye barley and oats. Preservatives and other additives tend to predominantly induce reactions outside the intestine such as rashes, wheezing and exacerbate eczema. There is still considerable controversy as to whether the hyper-activity syndrome and migraine are allergic in nature – so far scientific evidence is in conflict, but so-called Myalgic Encephalomyelitis (M.E.) and the Chronic Systemic Candidiasis syndrome do not appear to have any food allergy basis. Only when the adverse reaction occurs immediately after eating the causative food may the diagnosis of food allergy be easy to make. Otherwise with delayed reactions to food, such as when cell mediated and immune complex mediated mechanisms are involved, the offending food is very difficult to isolate. Infants tend more commonly to develop allergies to hen egg white, cow’s milk protein, wheat, peanuts, bony fish, sesame and even soy protein, whilst adults tend to be allergic to foods such as bony fish, shellfish, peanuts, tree nuts, tomatoes and kiwi. Although these foods are more commonly implicated in food allergy, almost any food can be a potential allergen. Food allergy usually manifests in babies with feeding problems and a strong family background of allergy. The high-risk infant is the one who has one or both parents with allergic disease. Those with a single affected parent have about a 37% risk of developing some form of allergy while those with both parents affected have about a 62% risk. The diagnosis is dependent on a clinical history suggestive of food allergy, with symptom improvement on withdrawing the offending food from the diet. The physical examination is often not particularly informative. There are a number of Diagnostic tests, which determine IgE mediated allergy by means of skin or blood testing. Skin Scratch Test solutions are commercially available from ALK Abello, Immunotek, Lofarma and Diagenics Ltd for most foods, but fresh extracts are preferable and should be used to test for fruit allergy. Phadia Diagnostics market a number of food allergy screening tests such as Total IgE and the CAP RAST fx5 Paediatric Food Mix which tests for 6 common paediatric food allergens (Milk, Egg, Wheat, Peanut, Soya and Peanut). In adults the CAP RAST fx1, fx2 and fx3 are additional screening tests for nuts, seafood and cereals respectively. There are also up to 160 individual CAP RAST tests available for different foods. Neither skin tests nor CAP RASTs alone can absolutely exclude or confirm the possibility of a food allergy. For example, Prof. Bahna (USA) has shown that in Cow’s Milk allergy confirmed by double-blind challenge testing, both skin testing and RAST showed similar although sub-optimal degrees of reliability. The sensitivity (true positive test) was 44% for skin testing and 56% for RAST, and the specificity (true negative test) was 67% for both. Therefore provocation challenge testing is the best way of confirming a suspected food allergy. The diagnostic “gold standard” in food allergy is the double blind placebo controlled food challenge test (DBPCFC). In reality it is very difficult to perform this challenge outside the orderly environment of an academic inpatient hospital. In the Primary Care setting, if a specific food is implicated, a trial exclusion diet is implemented, followed by the diagnostic re-introduction of the offending food. If no obvious food is suspected, then a simple elimination diet for two to four weeks is suggested. It should consist of either a extensively hydrolysed infant formula or only hypo-allergenic foods such as: lamb meat or chicken, polished rice, rice cakes, pears, bananas, water and sunflower or olive oil. In children, if despite the elimination diet, the symptoms persist, an elemental diet such as Neocate, a hypoallergenic amino acid based formula, should be considered. If Neocate and Pepdite is unavailable then Comminuted chicken or lamb meat may be used as a “homemade” hypoallergenic formula. The elimination diet for children is very limited and obviously not well adhered to by adults. In adults a greater number of foods may rather be used in a “few food” elimination diet. Once the allergy has settled after 4 weeks on the elimination diet, other foods are slowly re-introduced one at a time at weekly intervals. Each new food may be tried in small test quantities and then given in normal amounts every day for a week until the allergy provoking food is identified. Most foods can then slowly be re-introduced during the provocation testing period. Adults are tested by slowly re-introducing fish and shellfish, pork and beef, nuts, chocolate, legumes, white potatoes, tomatoes, oranges, strawberries, cows milk, wheat, eggs, pizza, fresh fruit and finally hens eggs. Provocation testing should not be performed if there is a history of anaphylaxis to a particular food (such as peanuts). Food allergy prevention measures should only be considered in babies with one or both parents manifesting definite allergic disease. Maternal diet in early pregnancy seems to play little or no role in the infant becoming food allergic, so dietary manipulation is not recommended at this stage. However, in the last 3 months of pregnancy and during breastfeeding, cigarette smoking should be strongly discouraged and milk, egg and peanuts avoided. The most effective form of food allergy prevention in the “at risk” infant is unsupplemented breast-feeding for at least the first four to six months of age. Breast-feeding should be encouraged as it reduces exposure to foreign proteins, helps to mature the gut barrier early, has anti-inflammatory properties and reduces the risk of infections, which can act as allergy triggers. The breastfeeding mother may wish to be careful about avoiding common allergenic foods such as eggs, cow’s milk and peanuts, as traces can theoretically pass into the breast milk but to date there is no convincing evidence that this actually sensitizes the at-risk infant. If exclusive breast-feeding cannot be established or maintained then a partially hydrolysed infant milk formula or an extensively hydrolysed formula such as Nutramigen, Pregestimil or Aptamil Pepti should be used. These hydrolysed formulae are produced by heat or enzymatic hydrolysis of cows milk casein or whey, rendering them hypoallergenic. The more complete the hydrolysis process the less allergenic the milk. Cow’s milk free formulas are expensive (£8 to £20 per 400g ). Amino acid based formulas (Neocate, Pepdite) are best as they are completely free of cows milk protein but are more expensive than extensively hydrolysed formulas (Nutramigen, Pregestimil, Pepti) which are the current preferred cows milk free formulas. However exquisitely sensitive infants may react to traces of cows milk protein even in extensively hydrolysed formulae. An amino acid based formula provides a good therapeutic trial for initial diagnosis of cow’s milk allergy, after which it would be more economic to switch to an extensively hydrolysed formula (if this is tolerated). Although soy milk is the cheapest alternative formula available (£4 per 400g), 20% of cow’s milk allergic infants will develop a concomitant soy allergy. Soy and Rice milks are not nutritionally suitable for infants Goat’s milk is inappropriate as it contains many allergenic proteins found in cows milk, so should not be recommended. Comminuted chicken meat suspensions are another alternative particularly if there is associated carbohydrate intolerance. Delay the introduction of solids until 6 months of age, initially introducing only rice, lamb meat, non-citrus fruit and non-legume vegetables. Potential food allergens in the diet, such as cows milk, soya, citrus and wheat, should be not avoided for the first year of life, as there is no concrete evidence that avoidance makes any difference to food allergy outcomes. Factors that promote allergic sensitization such as maternal cigarette smoking should be avoided whenever possible. Avoidance is easy to prescribe but in reality is very difficult to implement. Therefore the strictness of the diet often depends on the severity of the food allergy symptoms. Most food allergic children eventually tolerate cow’s milk, eggs and vegetables but usually remain allergic to fish and nuts. Food allergy is most prevalent in the paediatric age group. Eggs and cows milk seem to be the commonest causes of food allergy followed by peanut and wheat. Often infants will also develop an allergy to their soya milk and may even have an adverse reaction to “hypoallergenic” formulas. Once the food allergy is diagnosed, an exclusion diet is instituted. Calcium (400-800mg/day) needs to be supplemented in cows milk-free diets, and Vitamin B in wheat free diets. A certain amount of cross-reactivity occurs between foods of similar classes and this should be borne in mind if symptoms recur on specific food avoidance. For example if allergic to peanuts, then there is a high risk of being allergic to beans, peas, lentils, carob, senna and liquorice (all members of the legume family). But foods from divergent food families may cross react such as “celery-spice-carrot-mugwort syndrome”. This may be due to the presence of similar pan-allergens called Profilin and Lipid Transfer Protein (LTP) common to fruit, grass and vegetables and which accounts for the cross-reactivity we see between unrelated foods. It would appear that allergic reactions to fruit and vegetables, which often coexist with pollen allergy, are on the increase. These pan-allergens seem to play a protective role in plants and are induced by environmental stress such as plant infections, soil conditions, changes in weather and storage conditions. Birch pollen allergic people can have cross-reactions to apples and other fruit, grass pollen allergic people may react to melon, cereals and tomatoes, while those allergic to latex, react to avocado, chestnut, banana and kiwi-fruit. For two foods to cross react, the allergenic protein has to have at least 35% similar amino-acid homology. Profilin generally causes milder reactions and is destroyed by heat and cooking. Lipid transfer Protein (LTP) is heat and digestion resistant and can cause more severe systemic allergic reactions. 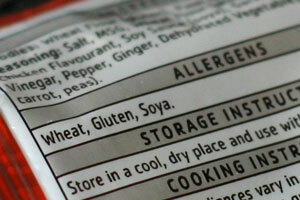 Hidden allergen sources also need to be identified as processed foods are notoriously inadequately labelled. Sometimes the apparent allergy provoking food is not the cause but another co-existent allergy, such as allergy to the Cod Worm parasite (Anasakis simplex) in fish mimicking a typical fish allergy, or allergy to the red spider mite on tomatoes or grapes being the allergen and not that food. If milk is implicated, then all sources of milk such as butter, cheese, buttermilk, chocolate, cream, ice cream, yoghurt and casein should be avoided and the diet supplemented with calcium and vitamin D. In wheat allergy avoid wheat cereals, crackers, pasta, snacks, bread, malt, sweets and supplement Vitamin B and Iron. Wheat allergic children can usually tolerate oats, rye, barley and corn. In egg allergy avoid egg white, albumen, egg lecithin, mayonnaise and other hidden sources of egg such as processed foods and batter. In severe hen egg allergy, children are sometimes skin tested with dilute (1:10) MMR vaccine although in reality the vaccine is extremely unlikely to contain egg protein. Peanuts may be hidden in soups, Chinese foods, marzipan and used as a bulking agent in many processed foods, they can even cross react with peas and beans. Soya protein found in infant milk formulas, baked foods, canned tuna, soups and sauces, is another allergen encountered. Peanut and soya oils are generally non-allergenic and safe to use in the diet. The main thrust in food allergy treatment is specific allergen avoidance. Medical treatment may sometimes need to be instituted if symptoms are severe and includes; antihistamine, adrenaline and corticosteroid medication. All people with documented food anaphylaxis should wear a Medic Alert bracelet and carry an adrenaline injection (Epipen) for self-administration. Allergy prevention medication such as cetirizine (Zirtek) should be recommended in the paediatric age group. This may reduce food allergen reactivity and slow the so-called “Allergy March” onto Eczema, Asthma and Nasal Allergy which are common sequels to food allergy. At present studies are being undertaken in Europe to assess how effective preventer-medicines are in stopping the “allergic march”- this is the so-called Early Treatment of the Allergic Child (ETAC) concept. The role of oral desensitization vaccines need to be further evaluated, but they may be a future therapeutic option for severe reactions to unavoidable food allergens. Finally, cautious re-introduction of a “prohibited” food can be attempted after 6-12 months as the natural history of food allergy is for gradual improvement. Foods implicated with anaphylaxis should not be re-introduced outside a controlled hospital environment. Most clinical food allergic reactions are immediate and IgE mediated. A non-IgE or T-cell mediated allergic reaction might be considered when an allergic basis is still suspected despite conventional skin prick and CAP RAST tests being negative. When evaluating food allergy one must also be wary of unproven diagnostic and therapeutic regimes. Chiropractors have popularised “food allergy” using dubious diagnostic tests such as Applied Kinesiology and Vega testing – these tests are of no value and are not reproducible. Practitioners should be aware of the fact that the publicity and “popularity” surrounding food allergy has spawned a new form of “Munchausen by proxy” – where the parent, convinced that their child’s symptoms are secondary to food allergy, institutes bizarre and nutritionally deficient diets. All exclusion diets must include adequate amounts of protein, carbohydrate, essential fats, vitamins and minerals otherwise malnutrition will occur. The advice of a qualified dietician should be sought if foods are excluded from the diet for any length of time. First published July 2009 and last reviewed 2nd January 2019.